These pepperoni and veggie Pizza Cake Pops have to be one of the funnest things that we have made. 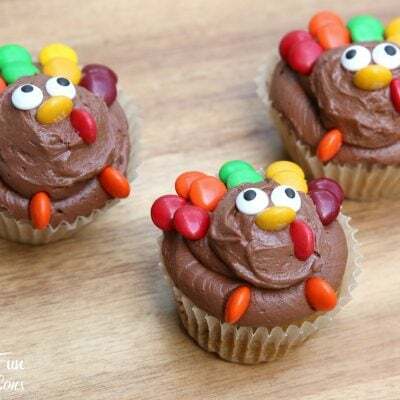 The boys got such a kick out of these and they are so easy to make! 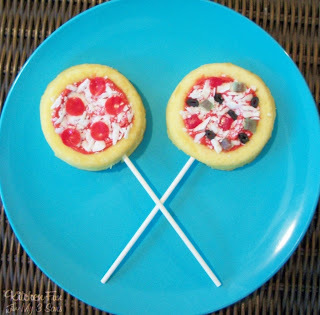 We made the pepperoni pizzas using pre packaged mini short cakes (Kroger brand 4 for $1), red frosting (we made ours, but you could use pre made), 1 white chocolate bar or white chocolate bark, 1 red fruit roll up, and lollipop sticks. We made the veggie pizzas using the mini short cakes, red frosting, white chocolate, red & green gum drops, black Tizzlers, and lollipop sticks. 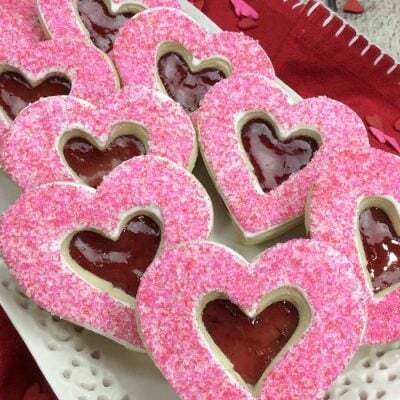 Spread the red frosting onto the middle of the shortcakes leaving the edges. Take a sharp knife and shave off some white chocolate to look like cheese. Sprinkle that onto the frosting. We used a very small round cookie cutter to cut out our pepperonis from the fruit roll up. Cut small pieces off of the red and green gum drops to look like peppers. Cut small pieces from the black Twizzler to look like olives. There is a whole in the middle so this works well. Make sure to poke in your lollipop stick towards the back where most of the cake is. My boys were running around with these and they stayed put! You could also get creative and make Hawaiin pizza using candy to make canadian bacon with pineapple or maybe sausage using cut up tootsie rolls! Next Post » Spaghetti and Turkey FOOTBALLS! wow what a great idea! They look just like real pizza's! 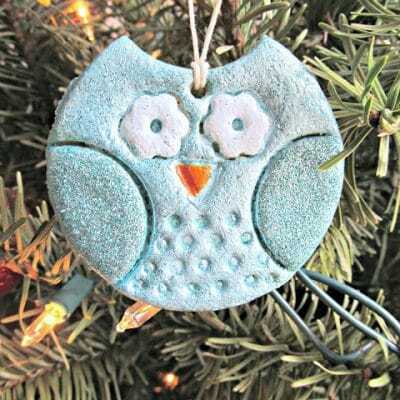 I saw you on handmade Tuesdays. Totally cute! 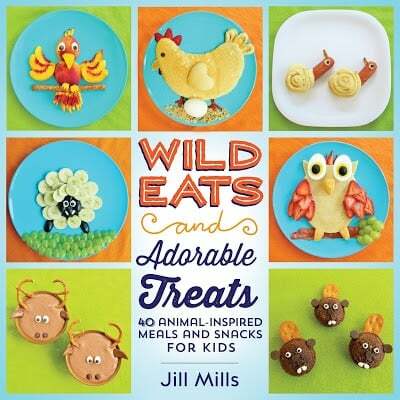 My kids would LOVE these!!! Oh my goodness these are precious! 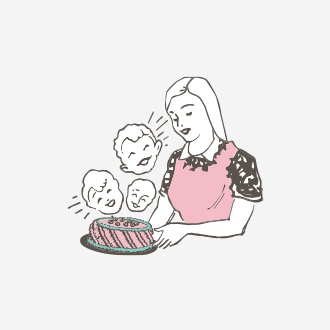 I'd love for you to link up at my link party! Hope to see you there! seriously, your ideas are TOO cute 🙂 So happy that I found this blog! 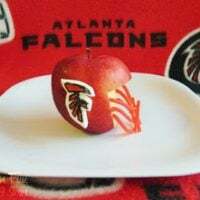 I have two sons and they enjoy healthy eating, but making FUN food is something I don't do near enough…now that I've found your blog, maybe we'll do this a little more! 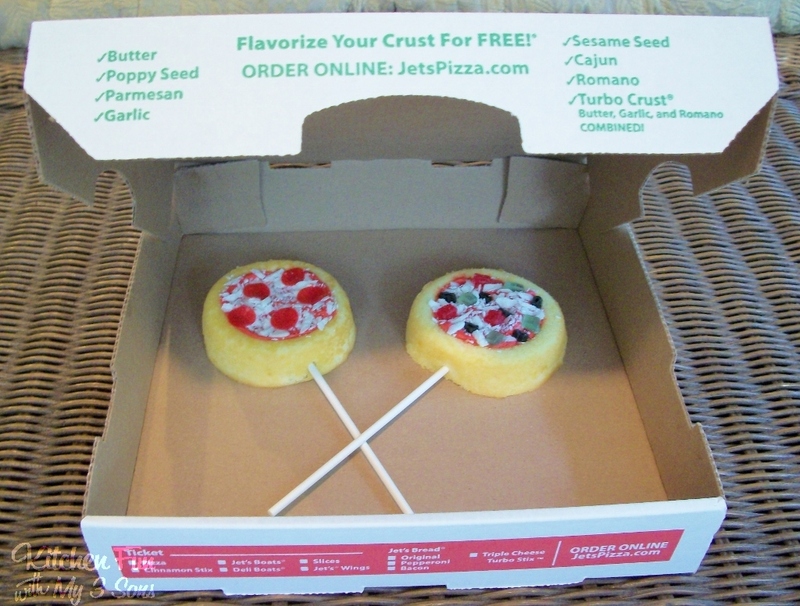 LOVE the pizza pops…could those be any cuter?! Sooo cute! I found you on Full Plate Thursday! These are adorable! I'd like to invite you to link up at my Friday Favorites party! I have to tell you, just from the picture I thought they were real pizzas. 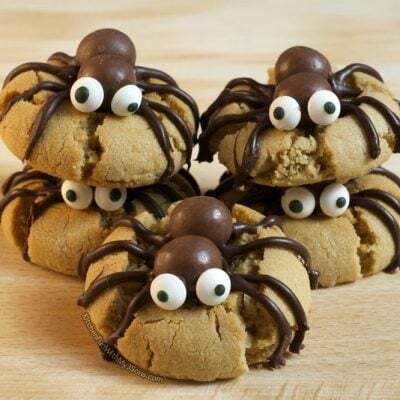 Even better as cookies. 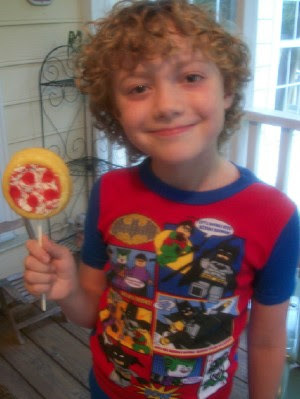 Jill, your Pizza Pops look so cute and looks like your son is about to really enjoy one. He is adorable! 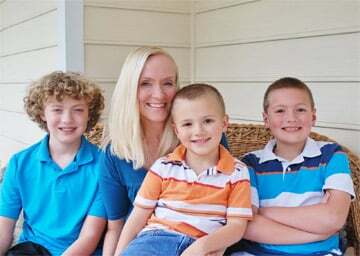 Hope you have a wonderful holiday week end and thanks so much for sharing with Full Plate Thursday. 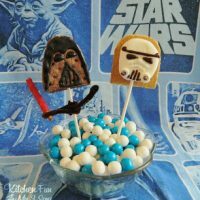 What a fun and yummy treat!! haha what a great idea! terrific and cute. 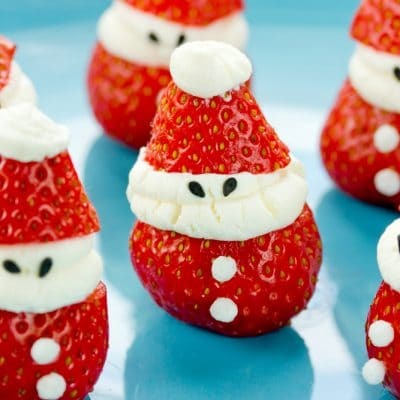 These look so fun and adorable! I love these. I already know I am going to feature these on Thursday afternoon. Thanks for linking to Bacon Time. 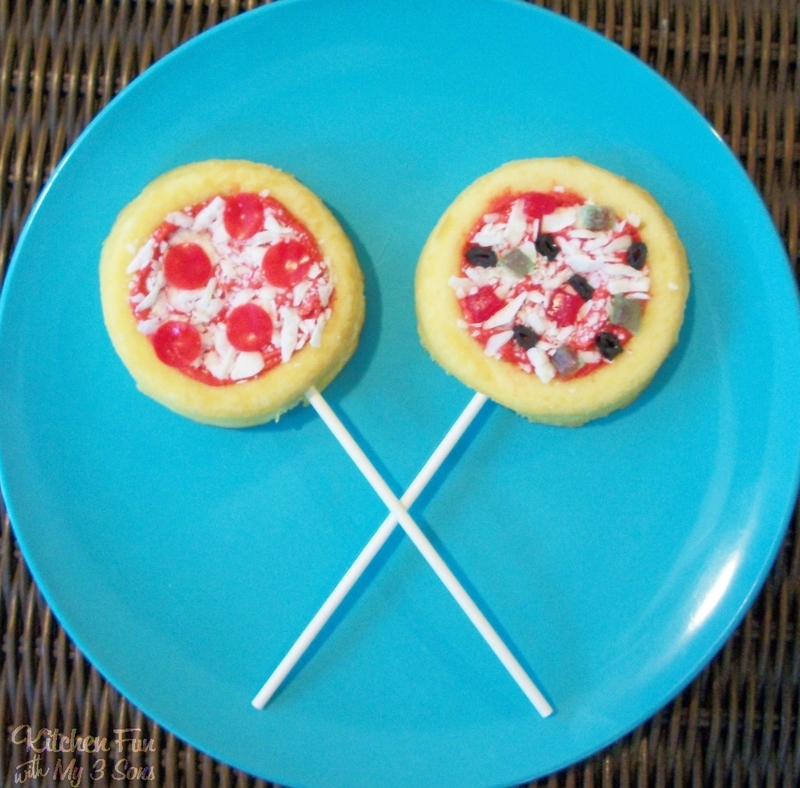 cute pizza pops! found you through a linky i was hooking up to! new follower! we would love for you to check us out too! Cute! I'd love to take these to the next "pizza party" we go to! you are so awesome to think of these :)!